Hillsborough Academy was the name given various schools established by prominent citizens of the town of Hillsborough over a period of 80 years. A school chartered in 1779 as Science Hall seems to have evolved into Hillsborough Academy by the time it opened in 1785. Subscriptions were raised among a number of North Carolinians for its establishment and the purchase of confiscated Loyalists' land, but the money was used only to repair the old Anglican church for use as the school building. The first principals of the academy were Benjamin Perkins and Solomon Pinto, both graduates of Yale. Zadoc Squire replaced Pinto as principal in 1787. The board of trustees included such illustrious eighteenth-century figures as William Hooper, Nathaniel Rochester, Thomas Hart, John Kinchen, Thomas Burke, James Hogg, and William Johnston. The curriculum had a practical bent but included classical subjects as well. Never a thriving institution, the school seems to have closed in 1790 after Zadoc's death. A second classical academy with the same name opened a decade later. In 1801 Hillsborough Academy was advertised as a school for "youth of both sexes" by trustees Walter Alves, William Kirkland, William Whitted, William Cain, and Duncan Cameron. The first principal, Andrew Flinn, was a graduate of the University of North Carolina in Chapel Hill. With an assistant, Flinn taught the classics, English, the "three R's," bookkeeping, and "the plainer branches of mathematics." Little is known of the female department beyond its existence under the direction of Elizabeth Russell in 1812 and a Miss Farly in 1815. The girls were taught needlework, painting, and drawing in addition to the elementary subjects. Thereafter no mention is made of the school's commitment to female education. For more than 25 years, the school for boys had a precarious existence under a series of short-lived principals. The Hillsborough Academy was again chartered in 1814, and in 1815 a Mr. Graham, not otherwise identified, was principal. In 1818 another Presbyterian minister, John Knox Witherspoon, became headmaster. Strict Presbyterianism assumed a prominent role in the curriculum; boys were required to attend morning and evening worship as well as church on Sunday, on which day they had to refrain from every kind of amusement including riding, walking, visiting, or studying. A new headmaster, John Rogers, served from 1821 through 1824. In 1825 another Presbyterian minister, the Reverend William Hooper, son of the signer of the Declaration of Independence of the same name, took over. With the arrival in 1827 of William James Bingham, the son of Presbyterian minister William Bingham, however, the school began its upward ascent to fame if not fortune. From 1827 until 1843, under the younger Bingham's direction, the school became synonymous with his name. He showed his mettle in 1839 when a student plot to resist authority was discovered. He accosted the renegades and commanded submission, routing the ringleader after the boy came at him with a pistol. Known as "the Napoleon of schoolmasters," Bingham kept the boys in line and the standards high. Enrollment was more than 100 students. When Bingham moved to the country to open his own school in 1844, Hillsborough Academy continued under his brother John Archibald Bingham and coprincipal James H. Norwood, both of whom had taught there. The next year they resigned, Norwood opened his own school, and John Witherspoon returned to head the academy. He had as an assistant James H. Horner, a former student and later a noted schoolmaster himself. Just as the old academy was floundering without a strong principal, it became subsumed in the Caldwell Institute, the creation in 1836 of the Orange Presbytery, under principal Alexander Wilson. A serious epidemic of typhoid fever had prompted Caldwell to leave Greensboro and relocate. Hillsborough citizens paid for the refurbishment of the academy building to accommodate the new school, which at first thrived but by 1849 had declined. Wilson resigned in 1850 and moved to Alamance County to open a school of his own. In 1851 Hillsborough Academy was resurrected by Benjamin R. Huske and Ralph Henry Graves, former teachers at Caldwell Institute, and again chartered in 1852. It continued under Graves through 1853. Hazell Norwood conducted the school in its last days from 1854 through 1858. 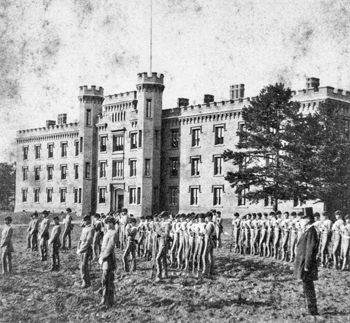 The building was occupied in 1859-60 by the Hillsborough Military Academy while its new buildings were being constructed.